Lyme Disease - body, last, causes, What Is Lyme Disease? Lyme (LIME) disease is a bacterial infection that is spread to humans by bites from infected ticks. Lyme disease can cause a number of symptoms, some of which may be severe. Jill lives in a small town in Delaware that is bordered by green woods filled with deer and other wildlife. In the summer, Jill likes to spend many of her days in these woods, playing with her dog, reading, staring at the trees, and daydreaming. It is peaceful there, and she enjoys feeling close to nature. When she was 13, though, Jill was bitten by a tiny tick that carried a nasty infection. Soon a red spot formed at the site of the tick bite, then spread into a circular rash. At the same time, Jill came down with a flu-like illness. She ran a fever, felt tired, and had a head-ache and stiff neck. Her mother took her to see her doctor, who recognized the telltale signs of Lyme disease. Thanks to quick treatment with the right medicine, Jill never became very ill.
Just up the road, Jill's friend Mike was not as lucky. He never noticed the tick, small as a pinhead, and he never saw the doctor for what seemed like a mild case of flu. Several months later, he started having repeated attacks of pain and swelling in his knees. By this time, Mike's Lyme disease was at a more serious stage. Even with treatment, it was a few months before the attacks stopped. Lyme disease is an infection that is passed to humans by the bite of tiny ticks. The ticks that spread Lyme disease to humans are much smaller than ordinary dog ticks. In fact, they may be little larger than the period at the end of this sentence. These tiny ticks belong to a group of species named Ixodes (iks-O-deez). Magnified photograph of a deer tick, adult male, Ixodes dammini. © Kent Wood, Photo Researchers, Inc. These ticks are infected with slender, spiral-shaped bacteria. The bacterium that causes Lyme disease is known as Borrelia burgdorferi (bo-REE-lee-a burg-DOR-fe-ry). The ticks that most commonly become infected with these bacteria often feed and mate on deer during the adult part of the tick's life cycle. In recent years, the number of deer living in the northeastern United States has grown rapidly. In addition, more and more people have moved into what were once rural areas, where deer ticks are found. These factors may have played a role in the fast rise of Lyme disease. Lyme disease can cause a number of symptoms, some of which may be severe. Early signs of infection include a skin rash and a flu-like illness. Treatment is quicker and easier at this stage. If left untreated, Lyme disease may lead to arthritis. It may also lead to serious heart or nerve problems. One type of Ixodes tick, commonly known as the deer tick or black-legged tick, is the source of Lyme disease in the Northeast, Midwest, and certain other parts of the United States. Such ticks feed not only on deer, but also on the white-footed mouse, other mammals, and birds. Another type of Ixodes tick, commonly known as the western black-legged tick, spreads the disease in the West. Although Lyme disease has been reported in nearly every state of the United States, it is most common along the northeastern coast from Massachusetts to Maryland and in Wisconsin, Minnesota, northern California, and Oregon. It also occurs in Europe, China, and Japan. People are most likely to run into the ticks that carry Lyme disease in the woods or underbrush. However, the ticks can also be carried by animals into lawns and gardens. Ticks can bite year-round. In the Northeast, though, the peak season for tick bites runs from April through September. On the West Coast, it runs from November through April. More than 103,000 cases of Lyme disease have been reported since 1982 in the United States. In 1997 alone, there were over 12,500 cases of Lyme disease reported in 48 states. The yearly total of reported cases was 25 times greater in 1997 than in 1982. Anyone can get Lyme disease. However, it often strikes children and young adults who live in or visit rural areas, because of their high risk of coming into contact with infected ticks. Campers, hikers, and outdoor workers who spend time in woodsy, brushy, or grassy places may also come across the ticks. The symptoms of Lyme disease depend on its stage. In most people, the first symptom of Lyme disease is a red skin rash, known as erythema migrans (er-i-THEE-ma MY-granz). It starts as a small spot at the site of the tick bite. Over days or weeks, this spot expands into a circular rash. Sometimes the rash looks like a bull's-eye, with a red ring surrounding a clear area with a red center. This rash can range from the size of a dime to the width of a person's back. As the infection spreads, rashes can appear at other places on the body. Along with a rash, people may have signs of a flu-like illness. Unlike the common flu, however, the symptoms tend to last and may come and go. Ehrlichiosis (er-lik-e-O-sis) is another disease that can be transmitted by ticks. In ehrlichiosis, the brown dog tick carries the Ehrlichia canis bacterium. 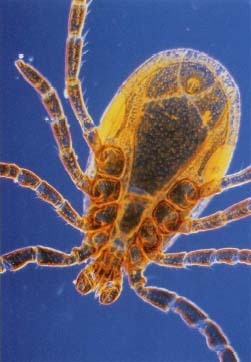 People with ehrlichiosis experience low-grade fever, muscle aches, and headaches beginning 1 to 2 weeks after being bitten by an infected tick. The disease usually goes away on its own. Ehrlichiosis occurs in the United States, Europe, and in a few Asian countries. Diagnosis may be difficult, because people sometimes get more than one disease from the same infected tick. In areas with ticks, it is important to take precautions against tick bites, and to remove ticks found on the body as soon as possible. The telltale circular rash at the site of the tick bite. © CDC, Peter Arnold, Inc.
Arthritis. This usually shows up as repeated, brief attacks of pain and swelling in the large joints, especially the knees. These symptoms can come and go for several years. More than half of people who are not treated early in the course of Lyme disease with the right medicines go on to get arthritis. Nervous System Problems. Up to 15 percent of people with untreated Lyme disease develop nervous system problems, which can include numbness, pain, weakness, stiff neck, severe headache, poor coordination, and temporary loss of control of the face muscles. Other symptoms, such as memory loss, poor concentration, sleep problems, and mood changes, have also been linked to Lyme disease. Such symptoms often last for weeks or months. Usually they go away, but they may come back. Heart Problems. Less than a tenth of people with untreated Lyme disease develop an irregular heartbeat, which can lead to dizziness or shortness of breath. Such symptoms rarely last for more than a few days or weeks. Lyme disease can be tricky to diagnose, because it may look like many other illnesses, including the flu and other types of arthritis. To diagnose Lyme disease, the doctor will ask about the person's symptoms. However, the unusual rash is the only symptom unique to Lyme disease, and 10 to 25 percent of people with the disease never seem to get the rash. The doctor also will ask about possible contact with ticks. However, many people with Lyme disease cannot recall being bitten by a tick. This is not surprising, because the tick is so tiny, and the tick's bite is usually painless. In addition, the doctor may do blood tests. Such tests look for anti-bodies (substances made in the blood to fight bacteria or other harmful things) against the bacteria that cause Lyme disease. Blood tests often give false results if done within the first month after a person gets the infection. After that time, the tests are more accurate, but some false results still occur. For this reason, the doctor still needs to rely on clues such as the person's outdoor activities in an area where Lyme disease occurs and the time of year when the symptoms began. Lyme disease was first recognized in 1975. An unusually large number of children in the town of Lyme, Connecticut, as well as two nearby towns had come down with the joint condition known as arthritis. When scientists tried to find out why, they discovered that most of the children lived near woods, which were the home to ticks. They also found that the children's illness usually started in summer, which was the height of tick season. The final clue fell into place when several of the children said they remembered having a skin rash just before the arthritis, and many said they recalled being bitten by a tick at the place where the rash appeared. Today Connecticut still leads the nation in reported new cases of the disease. New Disease or Old News? Doctors first recognized Lyme disease as a distinct illness in the mid-1970s. However, it may have been around much longer than that. In Europe, a skin rash similar to that of Lyme disease was described in medical articles dating back to the 1800s. Lyme disease may have spread to the United States by the early 1900s. Throughout the twentieth century, doctors noted a link between various symptoms of Lyme disease. It was not until 1977, however, that an article was published that described a "new" disease, causing skin rashes and joint pain, which was called Lyme arthritis. Today we know that arthritis is just one possible symptom of what is now called Lyme disease. In general, the sooner treatment for Lyme disease starts, the better. The disease is treated with antibiotics. Such drugs are usually taken by mouth, although they may be given in a vein in severe cases. In early Lyme disease, antibiotics usually work quickly and completely. In late Lyme disease, antibiotics still work for most people, although recovery may take longer. For a few people, symptoms may last or come back, making it necessary for them to take antibiotics again. Arthritis due to Lyme disease usually goes away within a few weeks or months after antibiotic treatment starts. It may take years to disappear completely in some people, though. If the arthritis had gone on long enough before being treated successfully, there may be permanent joint damage. A few people with nervous-system problems due to Lyme disease may also have long-term damage. Once cured of Lyme disease, people can get it again if bitten by another infected tick. One way to prevent Lyme disease is to avoid the ticks that carry it. Check with the local health department or county agricultural extension service in an area for information about where infected ticks have been found. In December, 1998, the first Lyme disease vaccine was approved for use by the U.S. Food and Drug Administration. In studies so far, this vaccine seems generally to be safe and work well at preventing Lyme disease in people ages 15 and older who do not yet have the illness. People in this age group may want to talk to a doctor about the vaccine if they live, vacation, work, or play in areas where Lyme disease is widespread. The vaccine is given as a series of three shots over a period of one year. It is not yet known whether booster shots will be needed in later years. The vaccine is not approved at this time for children younger than age 15. Stay away from areas with lots of ticks, such as thick woods or underbrush. Walk in the center of trails to avoid overhanging brush or grass. Wear light-colored clothing, which makes it easier to spot ticks. Cover up by wearing a hat, a long-sleeved shirt, long pants, socks, and boots or shoes. Tuck shirt into pants, and the legs of pants into socks or boots. Tape the area where pants and socks meet, so ticks cannot crawl under clothing. Shower and wash clothing after being outdoors in an area with lots of ticks. Use tick sprays with care; some should not touch the skin. Check your skin and check your pets thoroughly for ticks each day. Remove any attached ticks carefully: Tug gently but firmly with blunt tweezers near the head of the tick until it lets go of the skin. To avoid contact with bacteria, do not crush the ticlks body or touch the tick with bare hands. Wipe the skin around the bite with an antiseptic (a substance that kills bacteria). Veggeberg, Scott. Lyme Disease. Springfield, NJ: Enslow Publishers, 1998. Arthritis Foundation. "Lyme Disease." To order, contact the Arthritis Foundation, P.O. Box 7669, Atlanta, GA 30357-0669, (800) 283-7800. National Institute of Allergy and Infectious Diseases. "Lyme Disease: The Facts, The Challenge." To order, contact the NIAID Office of Communications and Public Liaison, 31 Center Drive, Building 31, Room 7A50, Bethesda, MD 20892-2520, (301) 496-5717. American Lyme Disease Foundation, Mill Pond Offices, 293 Route 100, Somers, NY 10589, (914) 277-6970. A group that supports research and informs the public about Lyme disease. The National Institutes of Health posts information about Lyme disease on its website. The U.S. Centers for Disease Control and Prevention, Division of Vector-Borne Infectious Diseases, 1300 Rampart Road, Colorado State University Foothills Research Campus, PO. Box 2087, Fort Collins, CO 80522, (970) 221-6400. A federal agency that studies Lyme disease. KidsHealth.org has web-based information on Lyme disease.